Leslie Stifelman’s career has a sustained philanthropy and deep empathy towards arts education as a necessary component in our global society. Whether she is working onstage or online through her extensive creative collaborations and partnerships, she endeavors to ensure the possibility of musical greatness in every child’s future. Leslie Stifelman is the founding teaching artist and contributor to Carnegie Hall's Musical Exchange - a global online community where young musicians (ages 13 and up) connect with each other, share their musical performances, and participate in groups and projects led by professional artists from Carnegie Hall. Musical Exchange focuses on musical sharing, creativity, and international collaboration. Young musicians from all over the world - representing over 20 countries at all levels and styles of music - are part of this special community. Some of the distinguished artists who interacted with the students through live masterclasses and videos were Tony Award winners Roger Rees, Christian Borle and Celia-Keenan Bolger. Students also had access to live stream concert broadcasts from Carnegie Hall’s Stern Auditorium. Are you identifying your character? Have you made a breathing plan? Dreaming of being on Broadway? Soundfly is a new kind of online music school that combines unique content with mentor support to help students become better musicians. In celebration of Carnegie Hall’s 125th anniversary season, the Weill Music Institute (WMI) is launching The Somewhere Project, a citywide exploration of West Side Story. This course is the companion piece to that project — taking you through the many ins-and-outs of the music, dance, staging and story of West Side Story to inspire your own great work of art. Music Is Alive and Well and Living in the Hearts and Minds of Children Everywhere. Created by Leslie Stifelman, Finding The Groove® is a series of live, multimedia concerts and on-line social networking, based on the Peabody Award-Winning HBO® documentary series The Music In Me, that celebrates kids and their love of music. At findingthegroove.com kids ages 7-12 at all levels of skill from beginner on up, who are playing instruments, singing or composing in any style, can share their own music videos and ideas about the music in their lives. The world premiere event, sponsored with funds provided by the NAMM foundation and The Alsop Family Foundation, is a pilot state-wide initiative in partnership with the Indianapolis Symphony Orchestra, The Indiana University Jacobs School of Music and Music for All. Set your time machine to the year 1730 and travel back 300 years to the Baroque period to hear the actual music people were listening to in those times, and also get to meet up close and in person the coolest composers, instrumentalists, singers and dancers, of that time or any time. 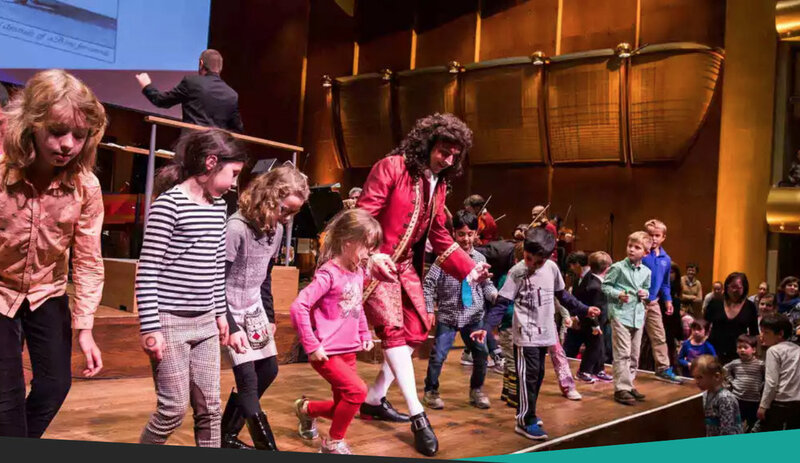 Leslie Stifelman co-created this unique and interactive Young People’s Concert where the audience joined the New York Philharmonic onstage through this journey from the renaissance to Bach.